China Word of Mouth Blog started me on a journey to better understand Chinese BBS (Bulletin Board Service) aggregators. A lot of the most interesting things are happening on China’s BBS, including the circulation of sensationalistic photos and lots and lots and lots of pictures of women with very few clothes on. More on that later. Here’s the #1 photo (for today? 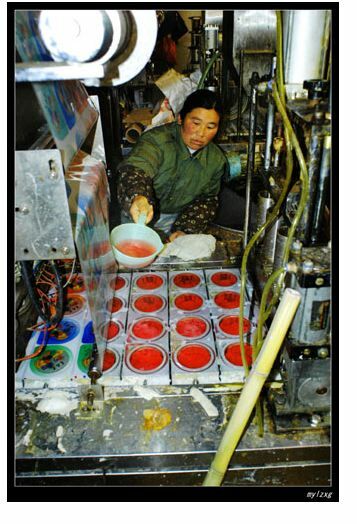 unclear) from one of the most popular BBS aggregators–it’s a beautifully shot series showing a messy small factory producing fake jelly candies. A lot of time is spent producing knock-off products, and trying to avoid buying knock-off products, especially when it comes to food and medicine. The influence of BBS in China has been largely controlled in last two years. When I was in college, BBS is one of the most important public sphere in virtual enviroments of Mainland China. The government also noticed the emergency of public opinion. So they made great effort to restrict its influence. Some college BBS such as YTHT of Peking University was shut down; some were restricted in campus ip-district, such as SMTH of Tsinghua University. A filter-out mechanics of sensitive words is built.